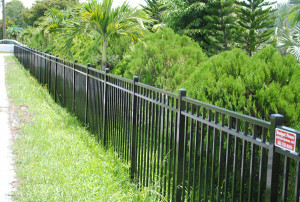 Aluminum fencing has several unique advantages. Because aluminum is less chemically vulnerable to corrosion than iron, aluminum fencing does not rust as easily as their iron equivalents. Also, aluminum fences are lightweight, which can be helpful when replacing the panels of your aluminum fence. Aluminum is a lightweight metal that is known for its high durability and ease of use. When used in fences, aluminum has many advantages over the common wood fence. Additionally, when comparing metal fencing options, aluminum is preferred over iron in many fencing applications. If needed aluminum can be powder coated which means the paint is fused to the metal surfaces. This makes aluminum fences very low-maintenance as it helps strengthen and protect the fencing. With powder coated aluminum you can actually choose a custom color to best match your style and create an aesthetically pleasing fence. If you need a new fence or want to repair an existing structure, the fence contractors at Budget Fence and Gate Systems in West Palm Beach have over 40 years of experience with all types of fencing accomplishments including aluminum fencing. Call us today for an estimate on providing aluminum fencing for your home or business.